The illegal prison camp at Guantánamo Bay opened on 2002-01-11. Today, eight years later, there are still 198 persons detained. President Obama pledged to close down the camp by 2010-01-22; this deadline will not be met next week. A demonstration organised by the London Guantánamo Campaign was held today outside the US embassy to commemorate this eigth anniversary, and to call for liberty and justice for prisoners held in Guantánamo Bay and to close down the detention facility there. Read the excellent photo-reportage by Peter Marshall published at Indymedia and, with more pictures, on his My London Diary site. (The picture in this post is from his report). To find out details of the 779 prisoners held at Guantánamo since the prison opened eight years ago, check out Guantánamo: The Definitive Prisoner List (Updated for 2010), the authoritative work by Andy Worthington. Some actions you can take: write to your MP and to David Miliband, Foreign Secretary to put more pressure on the Foreign Office to demand the return of Shaker Aamer, a Saudi national who was resident in London, and of Ahmed Belbacha, an Algerian asylum seeker who was living in Bournemouth. Neither man has been charged or tried. Encourage your friends in other European countries to lobby their governments to provide homes to those still detained in Guantánamo. 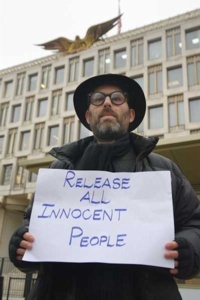 Innocent detainees, the majority, must be released to safety as soon as possible, and the few who have been charged must have a speedy trial (although it may be difficult for them to receive a fair trial after the years of abuse they have suffered and if 'evidence' obtained from torture is introduced). First published on 2010-01-11; last updated on 2010-01-12.